We weren’t even sure if we were going to throw a party this year since I was on call for the home delivery team (due 10/24 but he came early) and we had other issues going on. 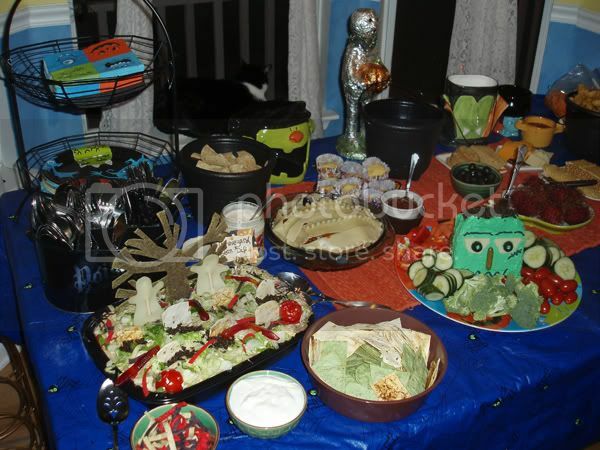 But we didn’t get invited to any Halloween Parties – so we ended up hosting after all. Last year the theme the group picked was Classic Hollywood Monsters, so we tried to work around Frankenstein, Dracula, and The Mummy. Mostly we sat around and talked and watched movies and youtube, like we usually do. But this time we did it in costumes and played some games in between. I’ll try to split this into a few posts so that it’s not so terribly long. Second up FOOD!! ! Then costumes and general pictures. 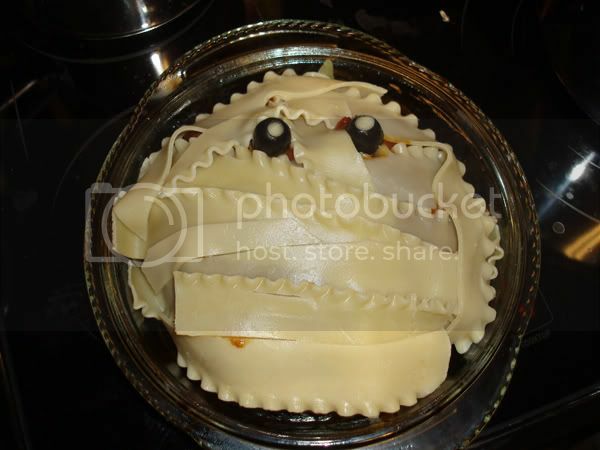 Monkeys made Mummy Meatloaf – which tied for favorite food dish and was eaten up completely. Reddheaded made Graveyard Dip – which tied for favorite food dish and was fantastic. Vegetarian, too. Basically it was a bean dip with lettuce on top to look like grass. 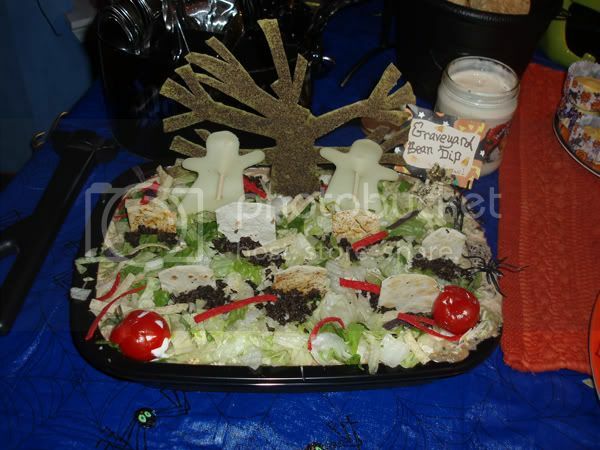 She cut out trees and gravestones from tortillas and baked them crisp to use as decorations. There were other decorations in there, too. I made Cheesenstein – and am very proud of me, darn it. I also used Halloween themed cookie cutters to cut out Colby cheese pumpkins, Cheddar cheese bats, and Swiss cheese ghosts. Mike brought his famous salsa and several people contributed chips, snacks, and drinks. Definite thanks to all who contributed!